Imagine sipping on a glass world-class Western Cape wine with your one and only while overlooking the breathtaking sloping mountainscape of Table Mountain, or the array of colours being painted on the horizon by the sunset with pristine beach sand between your toes or a view of the elegant rolling vineyards that produced the very wine in your hands. As one of Africa’s top tourist destinations, Cape Town is ideal for a romantic getaway, with a plethora of activities for a variety of tastes and interests. There are many luxurious hotels around Cape Town and surrounds. Opt for ocean view accommodation, choose a room with a view of the iconic Table Mountain, or choose a hotel that offers couples spa packages. The Sugar Bird Manor, The Vineyard Hotel, Kennedy’s Beach Villa or Grande Roche Hotel are superb choices. As the first country outside of Europe to earn blue flag status for some of its beaches, you don’t want to miss the opportunity to sunbathe, take a romantic sunset walk with your partner, and if you are brave enough, take a refreshing dip. If you are not a laze on the beach kind of couple, try traveling along the Cape Overberg or Noordhoek beaches on horseback for day trips or even overnight trail rides. Named one of the Seven Natural Wonders of the Modern World, this iconic mountain is one of the most visited destinations in Cape Town. With breathtaking panoramic views of the city of Cape Town and the Cape Peninsula, you and your partner are guaranteed some memorable selfie moments. There are various routes to hike up (some easier than others), or you can take the Cable Car and celebrate with a meal and a drink at the Table Mountain Café. This luxury experience will provide you with a view of the city that very few get to see. A perfect romantic activity for a honeymoon, or just to treat your loved one, offers breathtaking birds eye views. 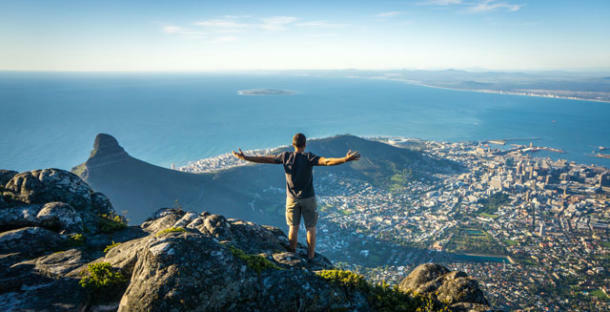 You can take flight from the Atlantic coastline to False Bay and Fish Hoek or fly to the beautiful Cape Winelands and taste some of the Western Cape’s most quaffable wines. Explore the city street by street with the City Sightseeing Red Bus Tours. This is one of the most desirable ways to view the city, hop on and off as you please at top local Cape Town attractions, through the gorgeous Cape Winelands, and experience exciting moments along the Western Cape’s delightful coastline. Routes include Red/City Route, Blue/Peninsula Route, Yellow/Downtown Route and Purple/Wine Tour Route all involving diverse stops. Whether you’re planning a romantic proposal or looking for the ultimate gift, a boat cruise provides a unique experience overflowing with romance. There are many various cruises available offering food and beverage options at the V&A Waterfront. The quaint town of Greyton, located in the Overberg area, with oak-lined roads and bitsy country cottages offers active couples many hiking routes and trails, perfect for a romantic walk with your lover. To spice up you visit to the Western Cape, spend a night with your love in a beautiful country house. Take a drive to the top of Signal Hill, which forms part of the Table Mountain National Park. It is the ideal location from which to watch the sunset overlooking the City of Cape Town. For our adventure seekers, you can fly model planes, go paragliding on a sunny day or simply enjoy nature with the one you love.